Join us for ten days on the magical north island of New Zealand. Enjoy luxury accommodations at various locations as we make our way from Auckland all the way to Mt. Taranaki. All hotels are 4- 5 stars as advertised. Enjoy gourmet meals from a variety of New Zealand's finest establishments as we adventure our way down the north island. Paleo meals with options for other dietary preferences. New Zealand has become one of the top producers of wine in the recent years. Privately tour one of it's most prestigious wine making islands. Taste some of it's most sought after creations. New Zealand has what many consider some of the best day hikes in the world. Experience three of the most sought after locations including Tongorrio Crossing, Geothermal Pools of Rotorua, and Mt. Taranaki. The Tongariro River is the most famous fly fishing river in New Zealand. Every year over 50 thousand prime-conditioned trout migrate up this river from Lake Taupo, providing truly amazing year-round fly fishing opportunity. White Water Raft a 20 ft. Rapid! Experience one of New Zealand's most sought after adventures, rafting the Kaituna River. Snake through steep native bush clad canyons and over 14 awesome rapids & 3 waterfalls including world-renowned 7 metre Tutea Falls, the Highest Commercially Rafted Waterfall in the World! Swim with dolphins in their natural habitat from our private tour boat. Truly a once in a lifetime experience! 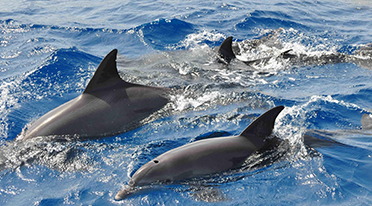 During your dolphin tour, not only will you come across wild Common and Bottlenose dolphins, you are also very likely to encounter epic Orcas, Humpback and Pilot Whales, beautiful turtles, seals and much more. Hangi is a New Zealand Maori word for a method of cooking in an outdoor pit oven. To "lay a hangi" or "put down a hangi" involves digging a pit in the ground, heating stones in the pit with a large fire, placing wire baskets of food on top of the stones, and covering everything with earth for several hours. Everything from the moment you arrive to the moment you leave. 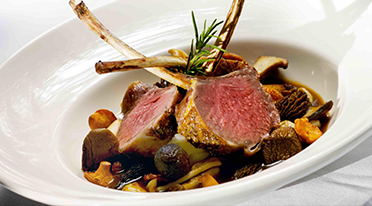 Gourmet Paleo Meals - Experience the culinary delight of New Zealand as we make our way thoughout the north island. All Adventures -Hiking, white water rafting and fishing. This just may be our most adventurous retreat yet! Transportation - All transportation is included from the moment you arrive to moment the adventure is over! Gratuities - All gratuities for adventures, transportation and meal services. Alcoholic Beverages - Included in each evening meal is two alcoholic beverages. No Stress Travel - At Bee The Wellness, we think of all the details so you don't have to. We've researched the best locations, adventures and experiences of New Zealand's north island. Come ready to adventure and we'll do the rest! Not included: Airfare, alcohol in excess of two drinks per night, tips for bell hop if used to deliver luggage to rooms, tips for breakfast meals done at own leisure. Travel Insurance (required). Below You Will Find The Daily Schedule of Events! 4:00pm - Check In The Sofitel Hotel In Auckland. 6:00 pm - Meet In Lobby for Dinner. Auckland boasts a thriving restaurant and dining scene and on day one we make our way to experience some of the culinary delights of the city! Get to know the group and leaders and shake off the jet lag as we begin our great adventure. 6:00am - 9:00am- Breakfast at your own leisure. We have arranged menu breakfast service for our guests to enjoy while at the Sofitel Hotel. Breakfast can be enjoyed whenever you are ready. 9:45 am: Meet in lobby to travel to the Auckland Harbor. 10:30 am Ferry ride to Waiheke Island We will be picked up by our private transport. 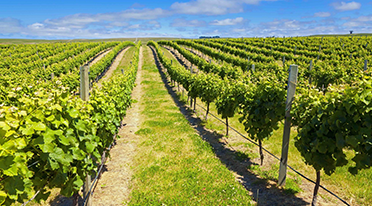 We will enjoy 4 tastings at some of New Zealand's most sought after wineries as well as a farm to table lunch as we soak in the views of the beautiful wine country. 4:30 pm- Return ferry ride to Auckland. We start with an early morning breakfast and then load up for our second adventure of the trip! 6:30 am Depart Sofitel hotel for our private dolphin tour. 8:30 am - Fulfill your dream of encountering the majestic dolphins in the open waters of Tauranga. Our vessel has custom built swim bars for the comfort and ease for those who don’t wish to free swim with the dolphins. 4pm. 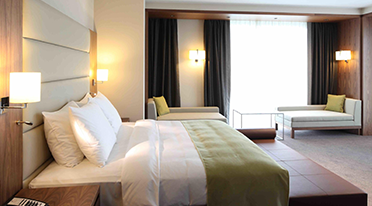 Check in to our next hotel location in Rotorua. 6:00am - 8:00 am - Breakfast at your own leisure. 8:15 am - Meet in lobby for shuttle to white water rafting base. Snake through steep native bush clad canyons and over 14 awesome rapids & 3 waterfalls including world-renowned 7 metre Tutea Falls, the Highest Commercially Rafted Waterfall in the World! 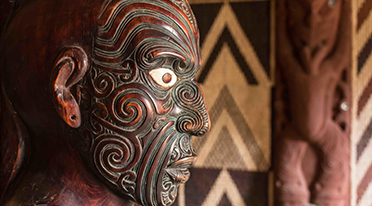 Blended with touches of Maori culture, this trip offers it all, for both white water rafting enthusiasts and first timers. 7:00 pm-Tradtional Hangi Concert and Dinner. 6:00 am- 8:00 am - Breakfast at your leisure. 9:00 am Geothermal River Jet adventure and tour! with some of New Zealand’s most beautiful, unspoilt Native bush. The sleek black boat takes you through the magnificent Tutukau Gorge where canyon walls rise 50 dramatic metres above the magnificent Waikato River. 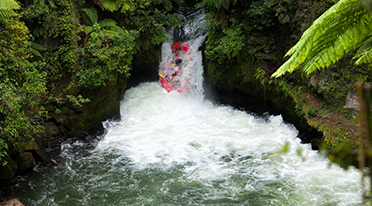 This is the only Riverjet in New Zealand that incorporates a geothermal wonderland experience. 4:00pm Check in to our Lake Taupo accommodations. 6:30 pm - Meet in lobby for dinner. 6:00 am - 8:00 am Breakfast at your leisure. 8:30 am meet in lobby for shuttle to Tongorrio Crossing. 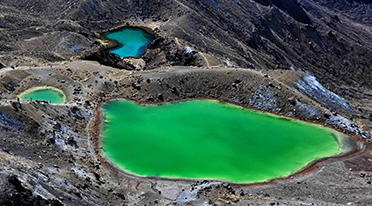 The Tongariro trail is often hailed as one of the best day hikes in the world. Our hike will take us approximately 5 hours as we cross through remarkable volcanic landscapes stopping to enjoy a picnic lunch along the trail. 6am - 10am- Breakfast at your own leisure. We have arranged menu breakfast service for our guests to enjoy while at the hotel. Breakfast can be enjoyed whenever you are ready. 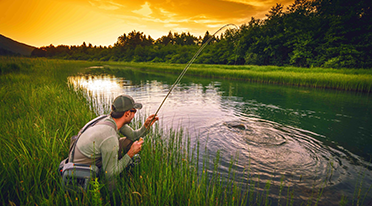 10 am - Enjoy a half day of fly fishing on the world famous Tongariro River. The Tongariro River is the most famous fly fishing river in New Zealand. Every year over 50 thousand prime-conditioned trout migrate up this river from Lake Taupo, providing truly amazing year-round fly fishing opportunity. The other half of the day will be spent enjoying our beautiful lodge which includes mineral pools and gorgeous grounds to relax enjoy and soak in. 6:30 Meet In Lobby for Dinner. 6:00 - 9:15 am - Breakfast at your leisure. 9:30 am Meet in lobby to depart for black water rafting glow worm caves adventure. The original Waitomo black water rafting tour that will have you exploring and tubing through mysterious Ruakuri Cave. Float down the underground river in rubber tubes, jump into cascading underground waterfalls, reflecting the glowworms above. Check in to Mt. Taranaki Accommodations. 7:00 Meet In Lobby of Hotel for Dinner. Hike Mt. Taranaki: Exact time TBD Taranaki stands sentinel in majestic isolation over the region it commands. Few volcanoes in the world can match its symmetry, which coupled with its bush clad backdrop and snow covered peak, forms the mesmerising focus of the Taranaki landscape. Get ready to sweat! A climb to the summit of Mount Taranaki is definitely not for the faint-hearted. Rising above the clouds, the 2518m summit of this dormant volcano offers truly amazing views. Weather permitting we try a summit hike. If not possible to do the summit there are plenty of incredible day hikes to choose from. 9:00 am - Final group breakfast! Let's get together to swap stories, information, hugs and farewells! Return on Shuttle To Auckland or continue on your own adventure. Ask us for help with planning your trip extension!